Earlier today, Consumer Reports announced their annual survey of the best domestic Cell Phone Carriers. After taking customer surveys across 26 cities, they found Verizon Wireless to top the list and AT&T at the bottom. AT&T came in last in 19 of the 26 cities they surveyed. While Verizon and AT&T are in a heated advertising battle over the best nationwide 3G coverage, this comes as a big blow for AT&T. The middle ones, T-Mobile and Sprint came in second and third, respectively. Just this past weekend, after spending time with family in the Bay Area (San Jose, CA), I drove back up to the Sacramento Area (Davis, CA). I had both my Apple iPhone running on AT&T and the Motorola Droid on Verizon Wireless. The Droid was able to provide voice-guided turn-by-turn directions and even display satellite and street views. My friend, also in the car, was able to multi-task and use the web browser with no issues. We randomly joked about the I Am T-Pain App for the iPhone. So we decided to buy it. It took nearly 10 tries and over an hour before it finished downloading. While I made a quick stop in the Berkeley Area, the iPhone couldn’t place calls, load Google.com in the Web Browser, or even finish downloading that App. AT&T’s network just didn’t work. It interestingly even displayed full signal, plus or minus one bar. My iPhone 3GS was fully charged and has all the latest updates. The Motorola Droid on the other hand breezed through any issues, other than for one or two brief “GPS signal loss” messages. While the unit did get somewhat warm and loose battery quickly due to heavy processing from the Google Maps Navigation App, it simply worked seamlessly with the Verizon Wireless network. While I haven’t used Sprint‘s or T-Mobile‘s networks nearly as much, they are both outperforming AT&T as well. I have never heard too many complains about those two either. If you buy a Cell Phone, you should be able to make calls with it. Unfortunately that’s where the problem lies with my iPhone tied to AT&T. 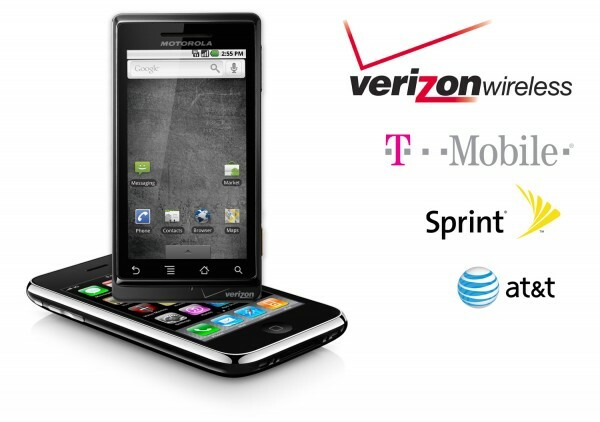 If I had the choice of purchasing a smartphone today, I’d definitely get the Motorola Droid no questions asked. If the iPhone were also available on Verizon, I might have a debate with myself to decide which to buy. For now, it’s probably best to stick with Verizon Wireless if you can. I am using iPhone on Tmobile for the past 2 yrs or so and have had no issues, of course at 2G speeds since iPhone does not support the T-mobile 3G spectrum. I travel extensively and have had no issues with Tmobile network/data anywhere except Alaska where it was patchy but ATT picked up signal. However, T-mobile caught up since it used ATT towers and charges no roaming!! Also, for those flying international, Tmobile is a boon as it has extensive coverage in Europe. I am not sure how good it is for ATT but an iPhone is an ipod touch when u go out of the country since ATT charges $20/MB!! !